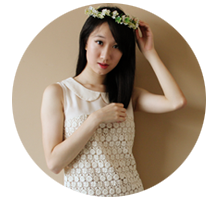 I have always been drawn to the mystical (Think: Birthstone, magic and fairies. ), so when The Sample Store dropped by my mailbox with an invitation to review Ginvera's latest range, amethystory, it was incredibly difficult not to decline despite (And I know I have whined about this countless of times on my blogs. I'm sorry!) my insane school load. 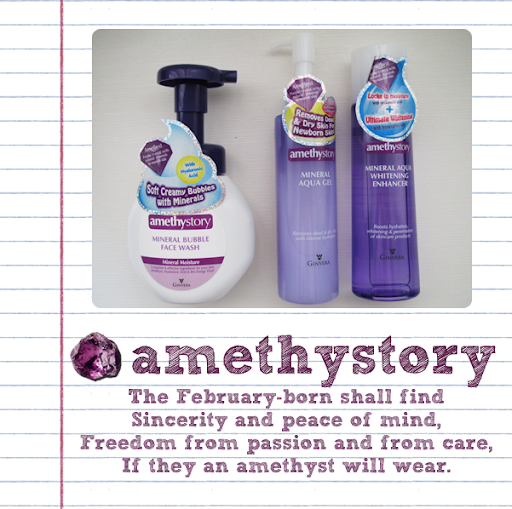 amethystory begins with the February birthstone, Amethyst. It's a semi-precious gemstone which comes in an array of violet shades. The name came from the ancient Greek word, 'amethystos', which means 'not intoxicated'. This in 'reference to the belief that the stone protects its owner from negativity'. It is also 'believed to be a natural tranquillizer for dispelling intoxication, relieving stress, soothing irritation, balancing mood and inspiring the intellect'. for review. I have been using these 3 products for a week and a half now. Amethyst: Enhances skin rejuvenation to reveal smoother, supple and more radiant skin. Hyaluronic Acid: Provides intense hydration and helps retain water in skin and supports the formation and maintenance of collagen production for supple skin. Bio Energy Fluid: Provides plenty of mineral and trace mineral elements to nourish skin cells and rejuvenate and hydrate skin effectively and helps keep the oilies at bay. This gel is to be massaged in a circular motion on dry skin for a minute. The white flakes you see above are the dead skin cells. It is then washed off with either water or cleanser. I'm no stranger to such a product, having dabbled in similar ones by other brands. I find that the white flakes come out a lot faster and quicker than others, which makes me a little suspicious about them being dead skin cells. But the thing is, after usage, my skin feels incredibly soft. There is a slight initial waxy feel though, so I choose to wash if off with a cleanser. The product's a lot cheaper than other similar products, and since I can't really vouch for the efficacy in removing dead skin by these products, I will definitely repurchase amethystory Mineral Aqua Gel based on the fact that it makes my skin feel the smoothest of all (Mirror, mirror on the wall. Who's the smoothest of them all?!? Haha!)! I use the amethystory Mineral Bubble Face Wash to wash off the aforementioned white flakes. Bubbles reduce the abrasion caused by the rubbing of skins and this prevents premature wrinkles. Blended with Amethyst, Hyaluronic Acid and Bio Energy Fluid too, this cleanser removes dirt and oil from the pores and moisturizes your skin so that it's as soft as pureed clouds! Tranexamic Acid: Fights dark spots and lightens complexion effectively to reveal a radiant glow and helps to even out complexion (Think: PIH!). After cleansing, I pat this all over my face and gawd! It feels incredibly luxurious! It seeps into the skin real quick and my skin feels like it has received all the hydration it needs! The hydration that it provides isn't too much! There isn't any uncomfy layer left behind and my skin feels completely at ease. Also, it has a pleasant scent, which leaves me real chilled out (Totally awesome for bedtime!). As for lightening, this enhancer has helped to lighten my PIH (No thanks to the recent midterms.). They are just faint marks now. :DDD I have taken to applying this on my neck as well, as we all know that the skin on the neck is the most neglected and also, the first to show signs of ageing.